The Lakers have had one heck of a summer league run resulting in their first ever championship. Lonzo Ball had said before the start of summer league that he wanted to win the whole thing. The Lakers certainly achieved that. Although Ball has been in and out of the lineup due to some nagging injuries, his teammates picked up the pace. Especially, 27th overall pick Kyle Kuzma. With the summer league title on the line and without Ball, Kuzma ended the night with 30 points in which he made 6 three-pointers. Another surprise was the shooting of guard Matt Thomas, and the athleticism of Vander Blue who constantly got to the basket with ease. The Lakers displayed what their philosophy has been since the start, and that is team basketball. 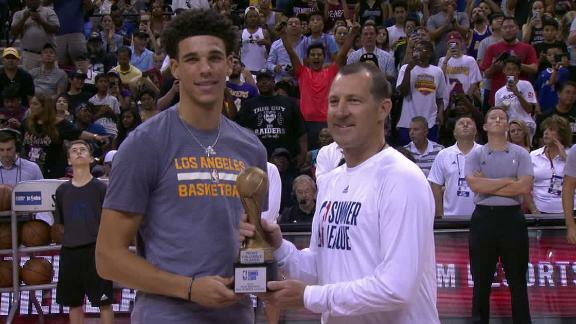 Before the start of the championship game, Lonzo Ball was awarded the summer league MVP by unanimous decision. Ball finished the summer league with 16.3 ppg, 9.3 apg, 7.7 rpg, and 2.5 spg. Ball didn’t play in the final game, but made his presence known throughout the tournament. At the end of the game, it was Kyle Kuzma who earned the summer league championship game MVP. It was really no doubt who was going to get that honor. Kuzma basically put the team on his back and guided them to a victory. It has definitely been a fun summer for the players and the fans. Rob Pelinka and Magic Johnson have done a real solid job of drafting and finding talent that will fit in coach Luke Walton’s system. This may just be “summer league” per say, but it’s a start and the future is looking bright for the Los Angeles Lakers.